How is it that I haven’t written about a proper meal since Cinco de Mayo? Here is what the last week was like. We had take-out Chinese food one night. It was Mother’s Day weekend and we had bagels and lox with the kids and grand kids. Then we had a dinner party on Monday which was great except I forgot to take pictures. This was followed by three days of John being at a conference and not home for dinner. Did I mention one night we just ate tater tots? So mea culpa for last week and probably next week as well as I am off to visit my best friend who is undergoing chemo-therapy. However, today I am posting my old standby dinner, penne plus some kind of vegetables in peanut sauce. Always a winner! 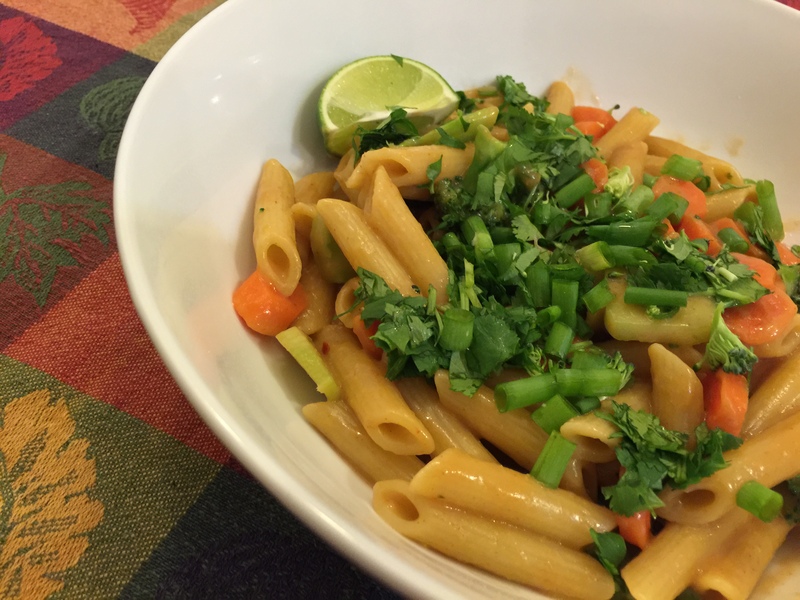 This entry was posted in Pasta, Vegan, Vegetables, Vegetarian and tagged broccoli, carrots, pasta, Peanut sauce, penne, Vegan, vegetarian. Bookmark the permalink.